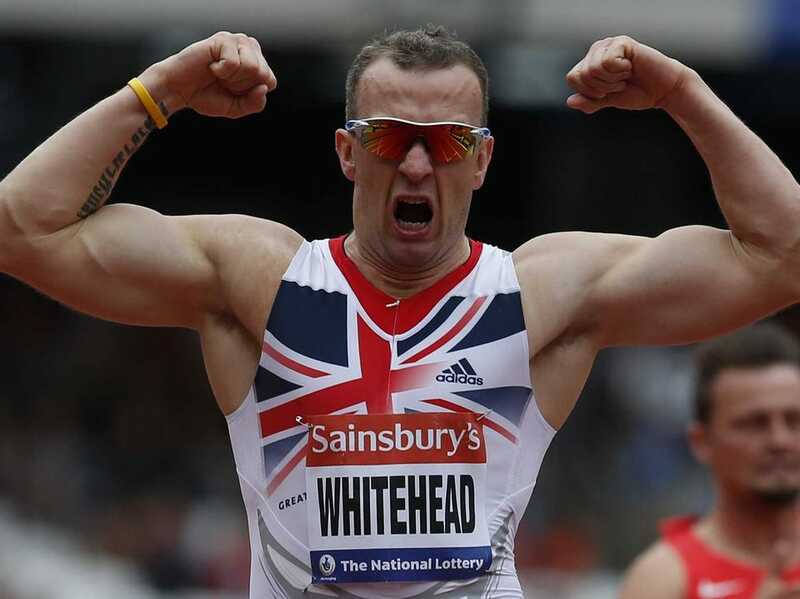 Data released on November 3 by the London Datastore gives a new perspective on the positive impact the Olympics had on local businesses. The areas where most of the games took place are now doing great: East London is by far the healthiest area in the city, while the rest of the capital has struggled to keep up the pace it was growing at before the financial crisis. 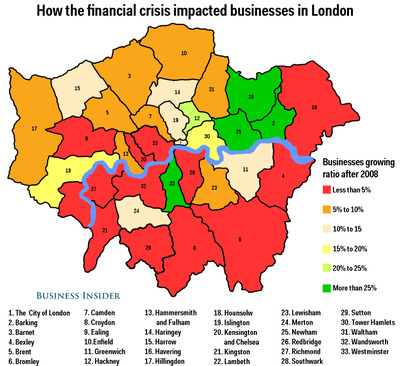 The map below shows the percentage growth rate in number of business from each of London’s 33 local authorities (ie. 32 London boroughs plus the City of London, which technically is not a borough) between 2008 and 2013. Barking is the best area overall. It had 3,150 business units in 2003. Five years later, in 2008, there were 3,970, meaning that before the crisis it had grown by 26%. But by 2013 the number exploded to 5,325 units, up 34% in the period after the crisis. Hackney is another booming district, while Newham, the area where Stratford and the Olympic park is, took the silver with 1,700 business units created between 2008 and 2013. Tower Hamlets is another buzzing hotspot, with almost 2,000 business units created in an area that includes Brick Lane’s vintage markets, the migrant community in Whitechapel and the financial firms of Canary Wharf. On the other end of the ladder are the areas in the west of the city and south of the river. Kensington and Chelsea is the borough that suffered the most, and the only one where the number of businesses shrank between 2008 and 2013: there were 13,305 in 2008, declining to 13,120 in 2013, meaning that 185 businesses closed down without being replaced. Lambeth was a pleasant surprise, businesses there grew by 3,410 units. That’s more proof that Brixton, which is part of this borough, is one of the hottest areas in London these days. Other locations were not that lucky. 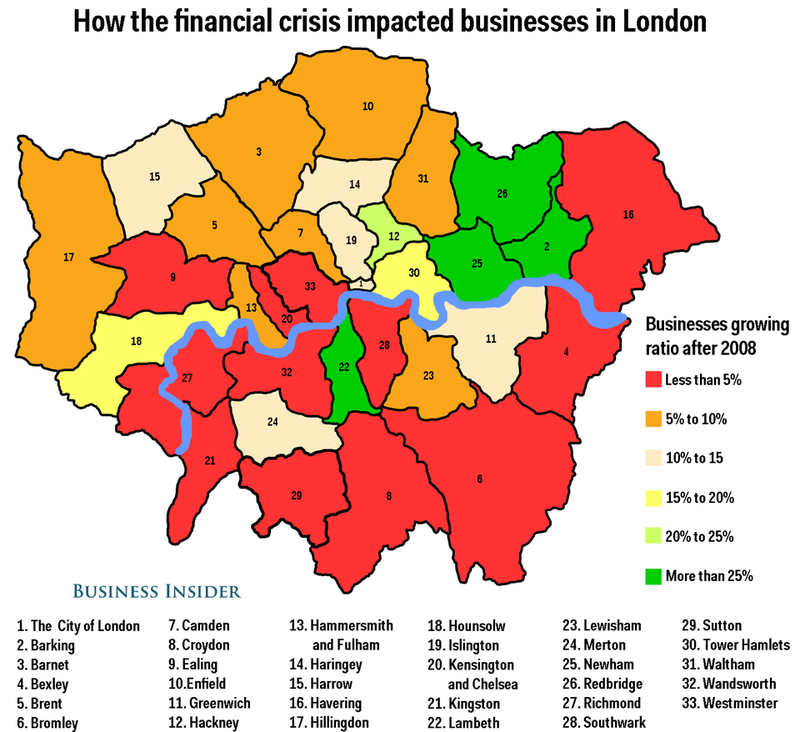 Southwark and Wandsworth have literally stopped growing because of the crisis: in the five years before 2008, the two boroughs were booming by 41% and 42% respectively. In the following period, neither saw growth of more than 5%. Business growth dropped from thousands to hundreds in a few months. Bromley also suffered badly: 3,460 new businesses opened before 2008, while only 135 did after the crisis. Havering was probably too far from the Olympic scene of Newham and Hackney: it grew by 1,785 units (29%) before 2008, but dropped 80 units in the following five years. London as a whole suffered badly from the crisis: while more than 85,000 businesses units were created before 2008, only 33,000 were founded in the five years after. Without the Games it would have probably been a lot worse.